At last Wednesday's meeting we had 12 Members and 3 visiting Rotarians: Viktor Grinewitsehus from Germany and Chris and Tamara Stilwell from Australia. The 4 Way Test was read in German by Viktor. 3) Elena Agala has invited our club members to a dinner on Thursday September 1st at 5pm. The dinner is a recognition and celebration of what The Rotary Foundation has done for the Philippines – and the world – especially in the eradication of Polio. 4) Sunday September 11th is our annual outing to Hastings Park. Please note that this is an afternoon outing. Friends and Family are welcome. To find out the costs and info regarding the buffet go to : http://www.hastingsracecourse.com/silks/ Racing starts at 1.30 p.m. 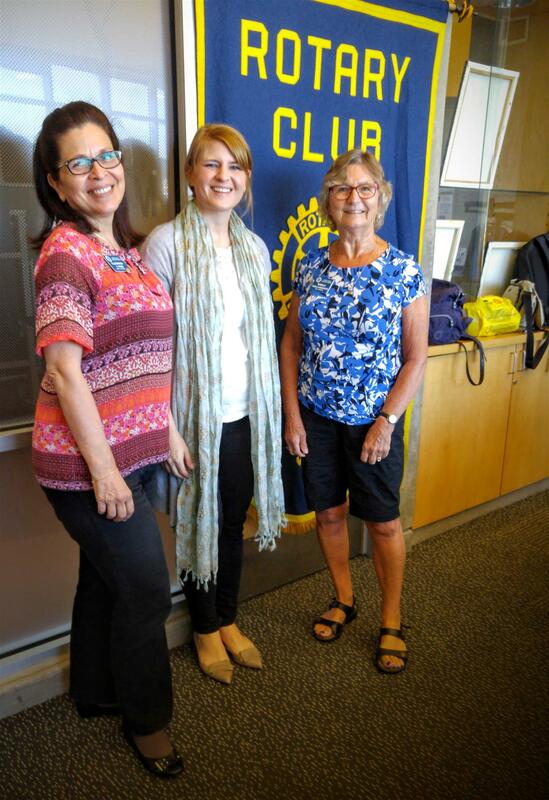 Guest Speaker - Our guest speaker today was Lauryn Oates who spoke about an organization called Canadian Women for Women in Afghanistan. Lauryn is a consultant in International Development specializing in Women's Rights Education and Literacy. In 1996 at the age of fourteen, she heard about Afghani Taliban regime's treatment of women and girls and was inspired to do something about their oppression. She founded Canadian Women for Women in Afghanistan, an all volunteer organization with 13 chapters in Canada. 1) CW4WA has 2 main projects, and "out of school" literacy and life skills program and to strengthen and equip the public school system. 3) There are now 8-10 million girls in school, up from near 0 under the Taliban regime.